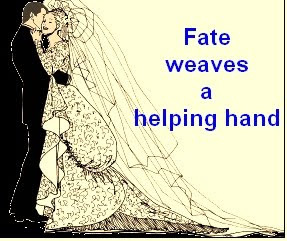 It's easy to see why some people believe that fate gives us a helping hand. Take Malcolm Stella, for example, from Essex In England. 52 years ago Malcolm had planned to spend the summer with a friend in Stockholm but fate took control and he had an accident. His chosen holiday was put on hold. Still wanting to go somewhere he stayed in England and went to Bournemouth instead. He was by himself at his chosen hotel. On the second night the waiter asked if he would like to share a table with a young girl who was also on her own. How could he refuse! The girl's name, by coincidence, was Stella and they obviously clicked because one year later they were married. Stella Stella has now been Malcolm Stella's wife for 52 'wonderful' years. How different his life may have been if he had gone to Stockholm instead if Bournemouth. Fate and coincidences seem to assist us with the weaving of our lives. Though I'm sure that we still have free will (where the government allows, of course!). At times we are simply given a helping hand. It's up to us as to whether we will take up what is placed before of us. It is my grandson, Samuel's first birthday today. Because of Samuel it really is a Wonderful World, he has taught me so much. Happy birthday Samuel! Wow, is he a cutie. A little guy born under the sign of Cancer. What a good story this one is, too. It would be weird, though, to have your first and last names the same! Happy Birthday, Samuel! Enjoy all the moments, Grandpa. Yes, we learn so much from the tiny miracles who come into our lives. I love the way they snuggle into my hugs. What a beautiful little boy! Aren't grandchildren just the best? ?